I work from home and I’m usually home alone. Knowing when someone comes onto my property gives me a sense of security. I get an alert as soon as someone drives or walks onto our acreage. I get a separate alert if someone approaches from the back of our property. Best of all, I can set up different melodies so that I know exactly where the movement is without looking at the receiver. There are many factors that I look for when choosing a product. Quality, dependability, value, and good customer service are all very important to me. Through some research online I found a wireless system that met all of my needs. 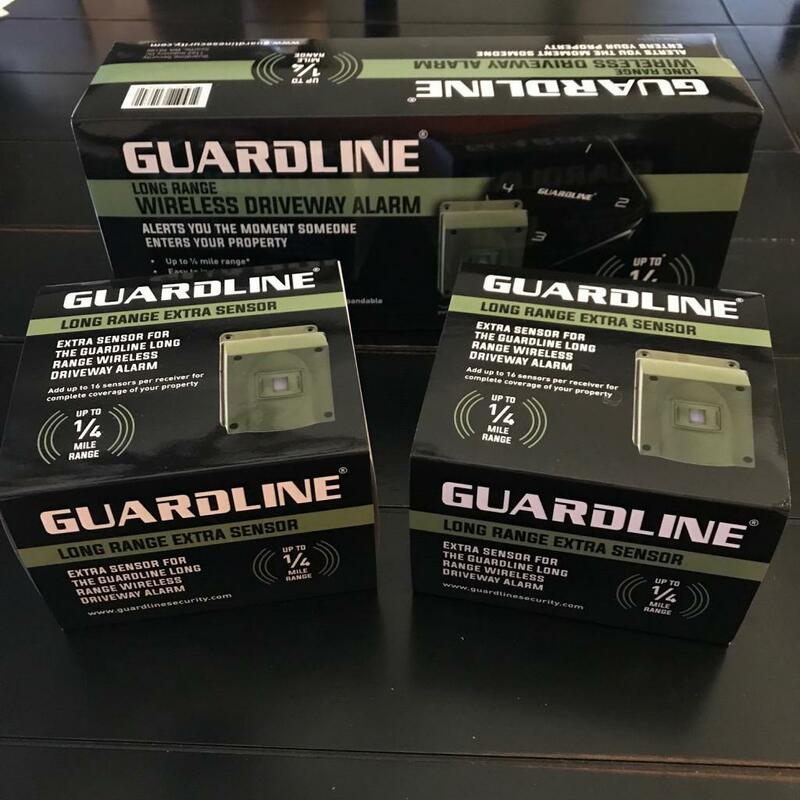 I contacted the guys at Guardline and they sent me a Driveway Alarm and two additional sensors to test out in exchange for my honest review. I initially chose the Guardline Driveway Alarm because of the following reasons. The experts at Guardline have created a wireless driveway alarm that has a 1/4 mile range. The sensors can be mounted near a driveway, walkway or porch. The receiver can detect a signal from the sensors from up to 1/4 mile away if there are no major obstacles in the way. They provide a 2-year warranty against defects in materials and workmanship when the product is registered on their website. While you hope you never need to call customer support, it’s reassuring to know that you they are there. I love buying from small business’ and the guys at Guardline are great to work with. So easy to install, I was able to do it in 30 minutes. Install batteries in the sensors & receiver. Pair the sensors & receiver. Installing the batteries is so simple. 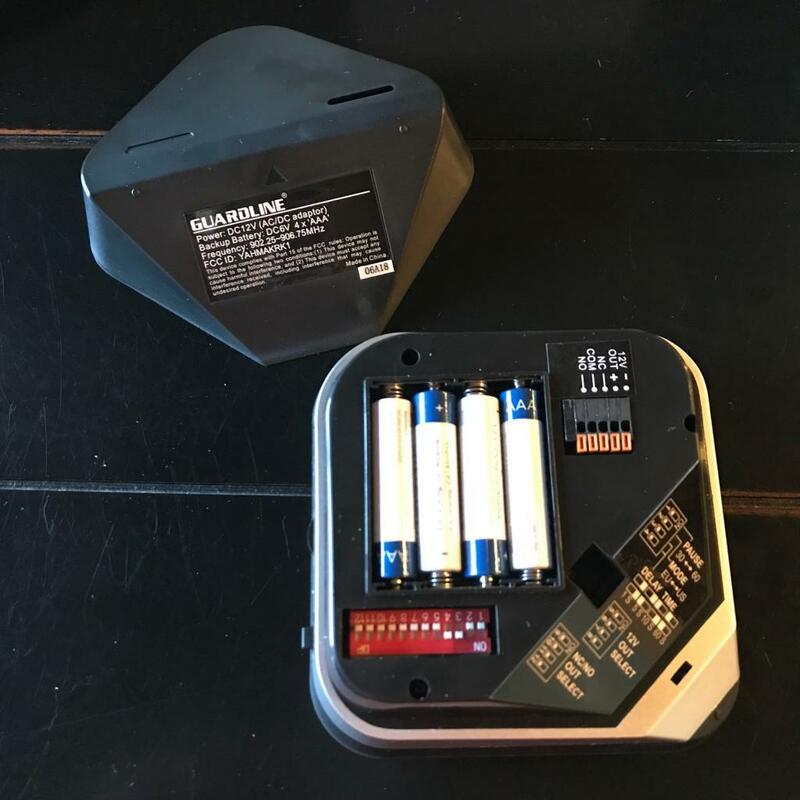 There are four screws on each sensor and Guardline includes a screwdriver in the box. You just have to supply four AA batteries for each sensor. The receiver comes with an AC adapter and takes four AAA batteries. You will want to keep it plugged in when using the receiver inside the house so that the batteries aren’t depleted quickly. 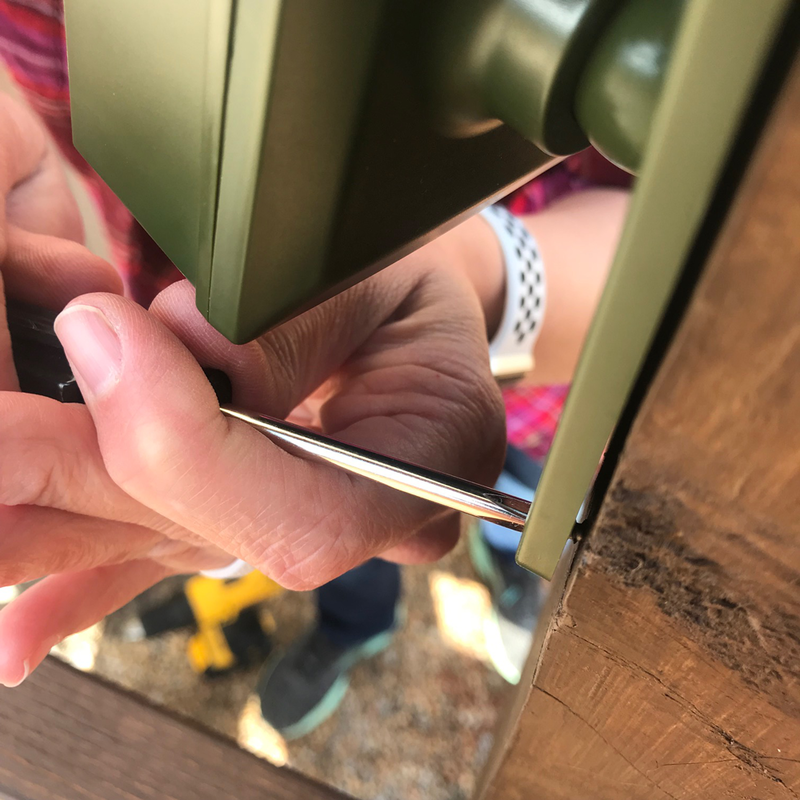 Remove screws with included screwdriver & insert batteries. 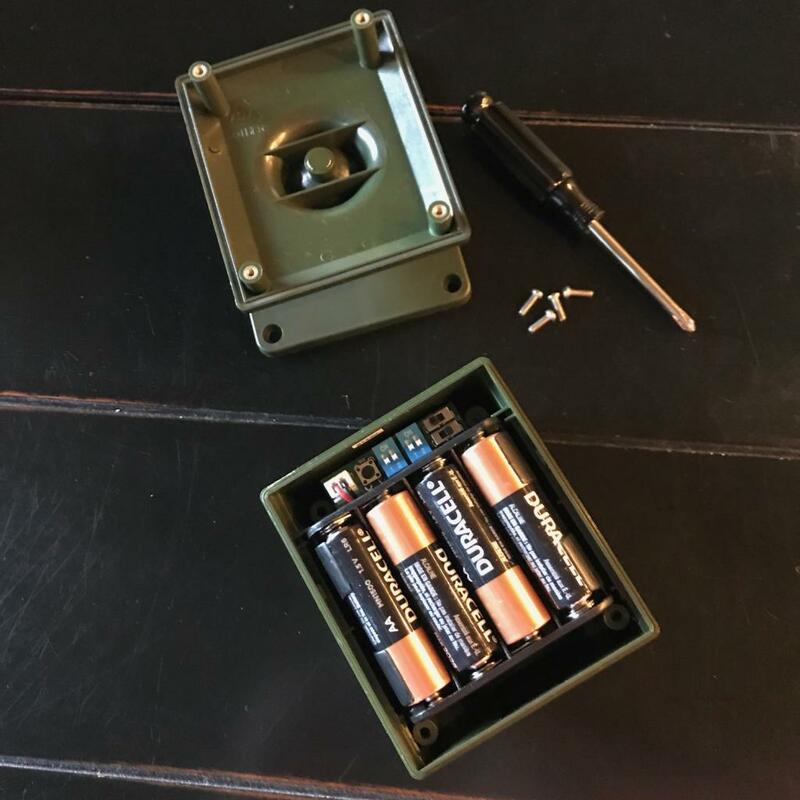 4 AAA batteries for the receiver. I was able to pair all three sensors with the receiver in a few minutes. The hardest part is deciding which of the 32 melodies you want on each sensor. Press and hold the LEARN button for 3 seconds. Press LEARN to select the zone to pair. Press MELODY to select the sound you want. Wave your hand in front of the sensor. Turn the receiver OFF then ON to exit LEARN mode. Choose the area that you want to monitor. I chose the entrance to the driveway from the street for my first sensor. I placed the second sensor next to the overhead door to our storage building. 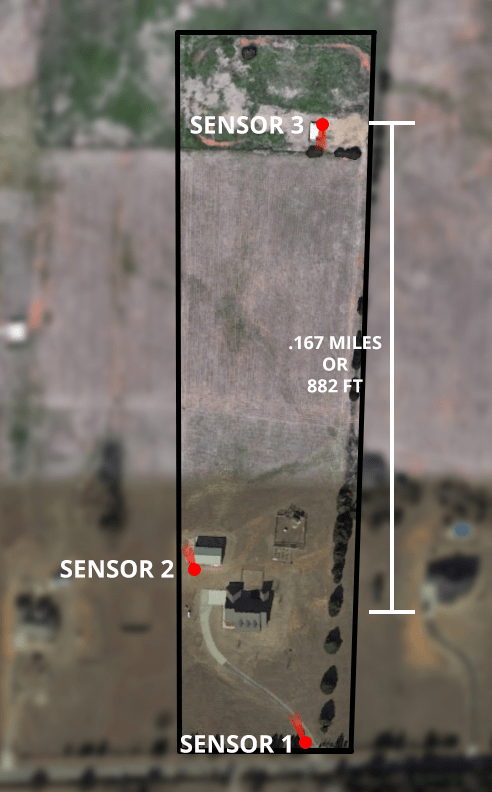 The last sensor is at the back of our property to monitor the storage shed and tractor. Plan on mounting your sensor 3-4 feet above the ground on a sturdy, non-metal surface. The sensor swivels from the base allowing you to direct the sensor eye toward the area that you want to monitor. Avoid placing the sensor in a location where the sun will shine directly into the sensor eye to avoid false alarms or sensor damage. Test your sensor before installing it. Hold it in place and have someone mimic a visitor passing in front of the sensor. I tested sensor 3 by having my husband wave his hand in front of the it while I was in the house with the receiver. I wanted to make sure that the distance wasn’t too far for the sensor to communicate with the receiver. Optional – template and tape. Mark the holes using a pencil and the sensor mount. Or use my template. For brick or masonry mount – drill pilot holes with a 9/32″ bit to a depth of 1″ then tap in included anchors. Screw the sensor mount on just until tight. Do not over-tighten. Adjust the angle of your sensor so that it is looking at your target area. Sometimes I have trouble holding things in place and marking holes. So I made a template that I could tape to my posts to drill my pilot holes. Then I removed the template and mounted the sensor with the provided screws. You can download it here and print it to help with your installation. 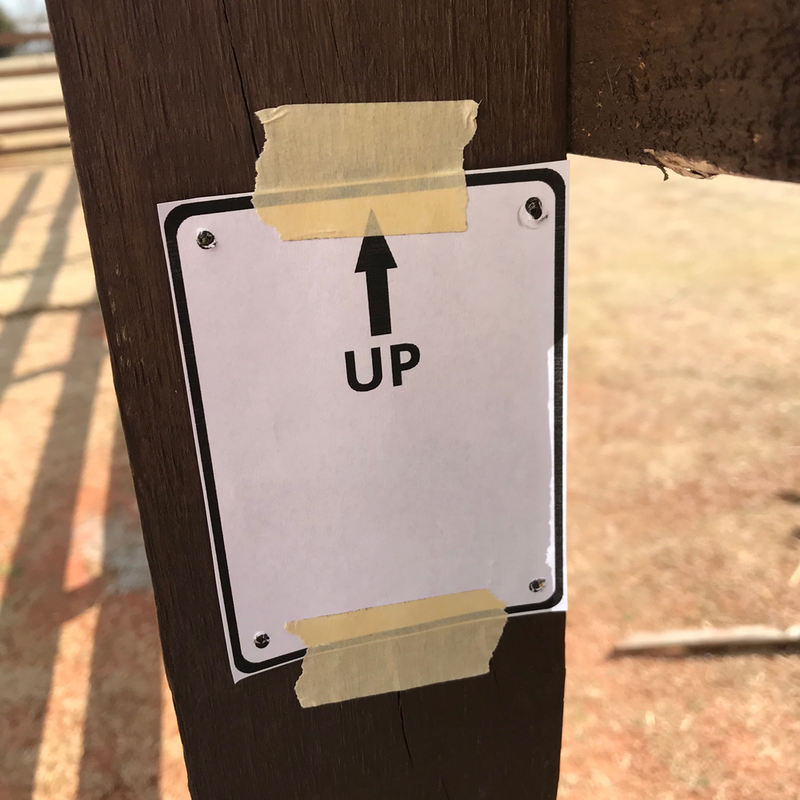 I used a Phillips screwdriver to mount the sensor to the post. Add up to 16 sensors per receiver for complete coverage of your property. We don’t have a fence around any part of our property so there is no way to cover every area that a person would enter. However, I think that the three locations that we have chosen would pick up most visitors. I like knowing that if we want to add more sensors we have that option. You can also add unlimited receivers in different locations in your house or shop. You’ll never be too far away to hear when a sensor has been tripped. I see this being very helpful if you have a two story house or a shop so that you aren’t having to move your receiver around with you. I installed the Long Range Wireless Driveway Alarm and 2 additional Long Range Sensors. Each sensor has up to a 1/4 mile range. This gives me enough coverage to detect anyone approaching the house from multiple directions. You can adjust the sensing area from 13 feet up to 40 feet. This is very helpful if you are monitoring a smaller area and don’t want to pick up any movement that is farther away. There is also a night mode that allows you to only monitor movement in low light or dark settings. The default setting is set to OFF so your sensor will work in both day and night settings. The sensors field of view can also be increased from the default of 9 degrees up to 12 degrees. Simply remove the sensor’s window cover. We’ve had the system installed for about a month and it has worked great. Our friend stores his trailer in the back next to our tractor. When he came to pick it up the other day I was alerted when he came up the drive. Then when he drove beside the building. And finally when he hooked up the trailer. I also knew exactly when he left the property. I have heard an occasional alert but didn’t see anyone outside. So it was most likely a bird. It doesn’t happen often so I don’t view this as a negative. I would much rather have a few false alarms than have an unannounced visitor at the door. I feel more at ease knowing when a delivery driver or salesman comes onto the property. I have plenty of time to look out the window or check our security cameras to find out who it is (and if I want to answer the door). If you are ready to get a Guardline Driveway Alarm System for yourself, use the code acrelife20 at checkout and get 20% off of your order. Just click on this link Guardline Security to start your order. They also offer FREE same day shipping and a 30 day money back guarantee. I would like to thank Guardline for partnering with me on this post. I love the product and will continue to spread the word to anyone who is looking for a reliable alert system.